In this article I won’t discuss the process of applying for a certificate, but rather will describe how to use that certificate to sign code on Windows, Mac and for Java. To start, you need a code signing certificate; I decided to purchase one through KSoftware (which is a reseller of Comodo certificates). After going through the application process and paying my fee, I ended up with two files; a Private Key (.pvk) file (with a password I specified during the application process) and a PKCS #7 Certificate file (.spc). 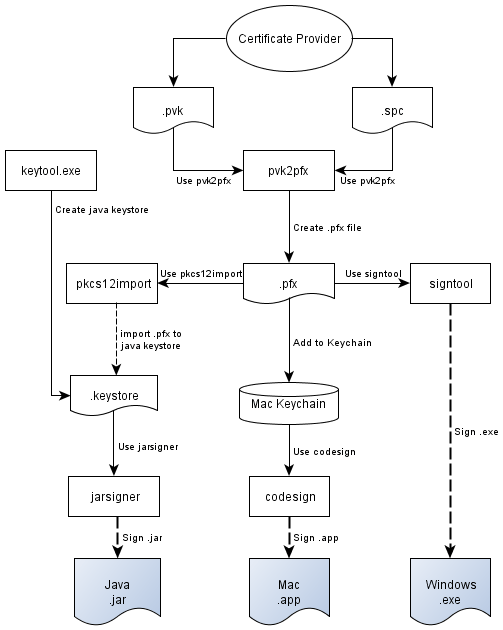 You may end up directly with a PKCS #12 (.pfx) file, but I will describe how to start with a .pvk and .spc file. There are many different steps and tools required to go from the original .pvk and .spc files, to the final signing of .jars, .exes and .apps. Below is a list of the tools I mention in this article. See the references section for where to download them from. There are many code signing tools available, (see references below), and many of them require a .pfx (PKCS #12) file, so the first thing to do is create a .pfx file from the .pvk and .spc files. 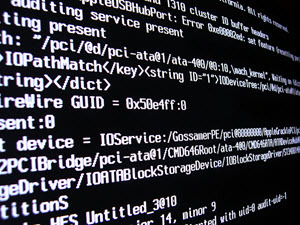 The Microsoft SDK provides a tool called pvk2pfx which provides this functionality. According to the Microsoft Documentation its usage is as follows. This command takes mypfkfile.pvk and myspcfile.spc and creates mypfxfile.pfx which has a password of mypfxpassword. (Note: you can optionally make the .pfx password the same as the .pvk password). This assumes the build file, .pfx and .exe are all in the same location and the build file is run from that location. This command creates a key with alias temp, and password temporary, and then creates a keystore called mykeystore.keystore with password mykeystorepassword, and adds the key to the keystore. With the next command, the key with alias temp, is deleted from the keystore, and you end up with an empty keystore ready for your certificate key. This imports mypfxfile.pfx into the keystore and secures it with the password mypfxpassword (in this case I gave the key in the keystore the same password as the .pfx file it came from, to keep things easier, but you can give it any password you want). This assumes the build file, keystore, and .jar file are all in the same location and the build file is run from that location. Note: this article first appeared in the December 2010 Issue (Volume 23, No. 12) of ASPects, The Monthly Newsletter of the Association of Shareware Professionals. Work great on the GUI, however, it doesn’t work well with conammd line. For example, the -p option will takes any files without any errors, and even with the right proj.ppe file, it didn’t convert the obfuscate the assembly. Every time the code is compiled, it seems to change the checksum value stored in the ppe file. As a result, because of the mismatch checksum, the assembly does not obfuscate. Please help.